born in Munich in 1964. His interest in electronic music was aroused at the age of fourteen while listening to the songs of 'Kraftwerk'. In 1996 he co-founded a live band for electronic and computer music called 'Négligé - electronic underwear'. In 1991 he not only founded his own label ARCHEGON' but also published under this label the CD 'Pränatal Inferno' by 'Négligé - electronic underwear'. Another milestone in this year was the foundationn of the musical project 'Six and more'. Its main feature is the quorum of at least 6 (electronic) musicians at each session. Since then several sessions of 'Six and More' have taken place all around Germany with up to 33 musicians and 3 CDs have been published so far (1993, 1996,1999). 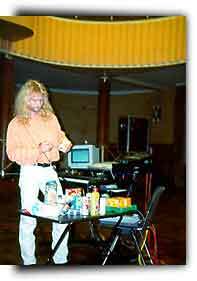 In 1995, Günter Schroth developed his Barcode Music Performance which had its premiere in Munich. In order to improve the quality of his music, he has since developed his own software and always strives to achieve new exciting sounds. He regularly cooperates with other musicians and artists: Besides 'Six and more' the projects range from the annual 'Noise Factory' project in Northern Germany to a Tea Ceremony Sound Performance at the Ethnographic Museum in Berlin or a 48 hours art event in Wiesbaden. His most recent project and the fulfilling of a longtime dream was the publication of his first solo CD 'Barcode Music' in April 2000.